(Dec 19): Hong Kong is host to the world’s busiest venue for initial public offerings this year. And the worst losses in a decade. A boom in technology listings has propelled local deal value to US$35.7 billion ($49.1 billion), ahead of the New York Stock Exchange, according to data compiled by Bloomberg. Yet companies that raised at least US$100 million dropped 6.2% in their first month of trading on average, the worst return since 2008. Weighted by IPO size, losses reached a record 6.9%, according to data going back to 1994. New-economy firms -- including tech, Internet and biotech companies -- accounted for more than 40% of Hong Kong’s proceeds this year, up from about 20% in 2017. They’ve also been some of those that suffered the most, with tech shares on the MSCI Hong Kong Index sinking more than any other industry group as giant Tencent Holdings heads for its worst year on record. Ping An Healthcare and Technology, listed in May, and Ascletis Pharma, which began trading in August, have plunged 43% and 57%, respectively, from their offer prices, ranking among the worst-performing new stocks this year. In Ping An Healthcare’s offering, zealous retail investors placed orders for 654 times the shares initially available to them. 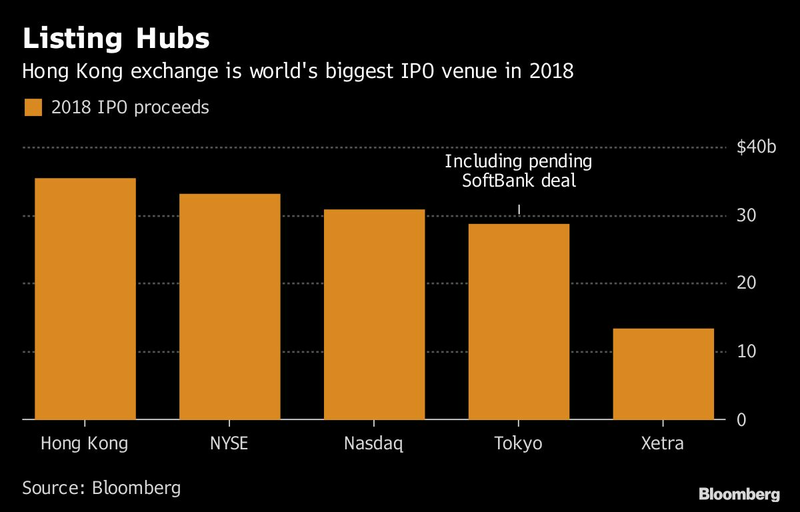 Hong Kong’s listing reform to attract technology companies helped boost IPO supply, but the demand remained slack amid macro weakness, said Philippe Espinasse, the author of “IPO: A Global Guide” and former head of Asia’s equity capital markets group at Nomura Holdings. In July, smartphone maker Xiaomi sold shares in Hong Kong for a valuation of about US$50 billion, a far cry from top executives’ target of US$100 billion last year. Food-delivery giant Meituan Dianping, which aimed for a minimum market value of US$60 billion, settled for about US$50 billion in its September listing. E-commerce platform Mogu slashed its valuation goal by more than half for a US debut this month. “Few IPOs have exhibited cornerstone demand, while levels of over-subscription, both for institutions and members of the public, have frequently been on the low side,” Espinasse said. For firms that raised more than US$100 million in Hong Kong this year, individual investors placed orders for a median 1.6 times the stock available to them, down from 2.4 times in 2017, data compiled by Bloomberg show. Despite sluggish demand, Chinese companies decided to go ahead with their listings to bolster their war chests as the U.S. increased interest rates and fought with China on trade, Espinasse said. First-time share sales have raised US$33.1 billion on the NYSE and US$30.8 billion on the Nasdaq this year, data compiled by Bloomberg show. Hong Kong would rank No. 2 among countries if the two American exchanges were combined for US proceeds.